Hi, Good Morning, Thank you all friends and viewers. Today I will post how to make Pani puri at home. I made them long back, but could not post it immediately as I was writing other traditional recipes. Today I have no other recipes readily available, so this occupies. Pani puri is a common street snack across India. It consists of small puffed, crispy puris filled with spice water and curry. We have to have each puri in one gulp. It is one of the most favourite time pass street food for many people. We love to hang out and have a chit-chat with friends at chatbhandars(a small street food joints). We can make puris also at home (that recipe will be posted soon), but it takes longer time. We can keep them readily available a day before making pani puri. I too made them at home and prepared pani puri. But for now I prepared it with store bought puris only. 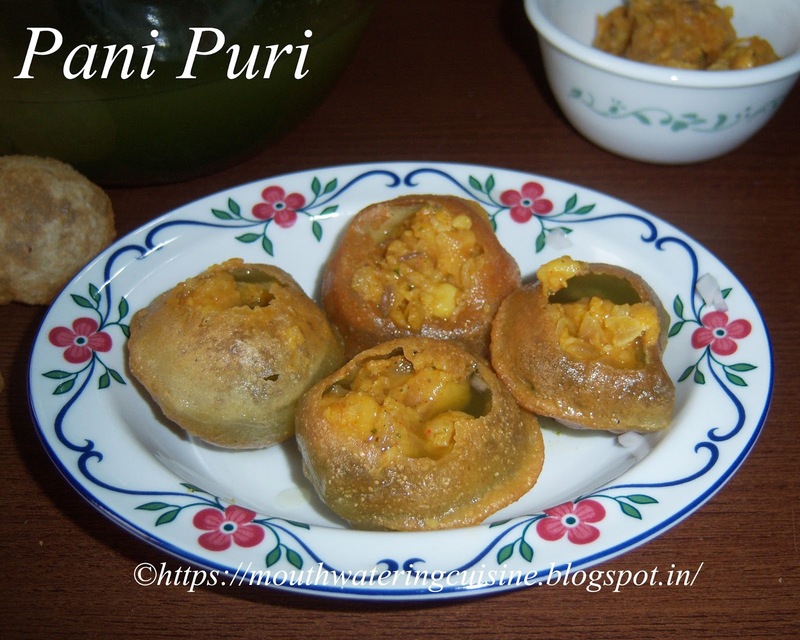 Pani Puri - a street food across India. Soak chickpeas/kabuli chana for 4 to 6 hours. Add salt, turmeric powder and potatoes to them. Pressure cook them for five whistles. Allow them to cool and mash them with masher and keep aside. Heat oil in a kadai, add the mashed kabuli chana and potatoes. Add all spice powders, salt, turmeric powder, red chilli powder, garam masala and coriander powder to it. Allow this to cook for five minutes. In a blender jar, combine all the ingredients. Add little water and blend them to make smooth paste. Sieve it to get juice. Add remaining water to the juice and keep it in refirgerator. Keep all the items, Pani, Curry,Puris and a plate to serve, readily available. Take each puri, make a small whole in the centre. Fill it with chopped onions(optional, no one likes in my home except me). Fill with the curry and then dip the puri in the pani to fill it. Or you can fill the pani with a spoon. Serve them immediately. Enjoy!! each pani puri in one gulp. For more Indian street food click here.Thank you for visiting my blog. Hope you liked all my recipes. Any feedback and comments are appreciated.